This is a basic sauce which is very versatile in its use. Once you master this, you can make pastas, risotto, sandwiches, baked dishes and a whole lot more. Make it fresh so you don’t have to store it in the fridge and it tastes the best! I have mentioned the use of this in one of the recipes I have posted recently so check that out too. 1) Stud the onion with the cloves ie pierce/ insert the cloves in it. 2) Take some cool milk (this is important), add the onion and bay leaves and then bring to a boil. Cool and strain. 3) In a pan, mix the butter and flour on a slow flame. 4) Pour in the cooled milk little by little while continuously stirring. Ensure that there are no lumps. 5) Mix in the salt, pepper and mixed herbs and continue to cook till it slightly thickens. Remember to not thicken it too much by cooking as the sauce continues to thicken off gas. The sauce is now ready to use. 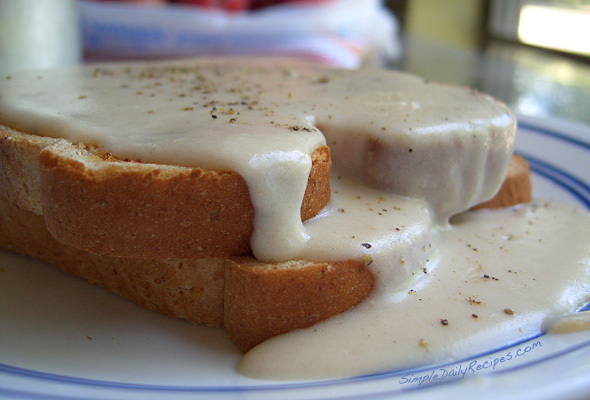 Cheese sauce – Once you remove the sauce from heat mix in 2 Tbsp of cream cheese in it to make a cheese sauce.